Second form is a collection of 15 modern thoughts in card magic focused on visual and practical applications. Here you will find completely new ideas and reassembled classical moves for your performances. Nick Vlow & Sergey Koller go into great detail on the moves and motivation surrounding these new applications. Sprout - a visual pop-out from the middle of the deck. The card could be produced as appearing in front of the spread, or fly away from the deck towards spectator. As a bonus you will learn double lift variation. Penguin Steal - useful card move for a color change or stealing of the selected card. NZ Change - fast and direct color change based on classic palm changes. Several variations are included. Rotation Change - unbelievable move that allows you to change a card by revolving it between your hands. Astra Cascade - remastered version of classic F. Miller Cascade Control. The method allows you to control multiple cards or use the cascade as a color change. Mason Addition - simple and direct switch of a single card in your hand. Perfect for transpositions and prediction tricks. Swindle Double - a clean double lift from the top of the deck. Top cards are flying away to your other hand. 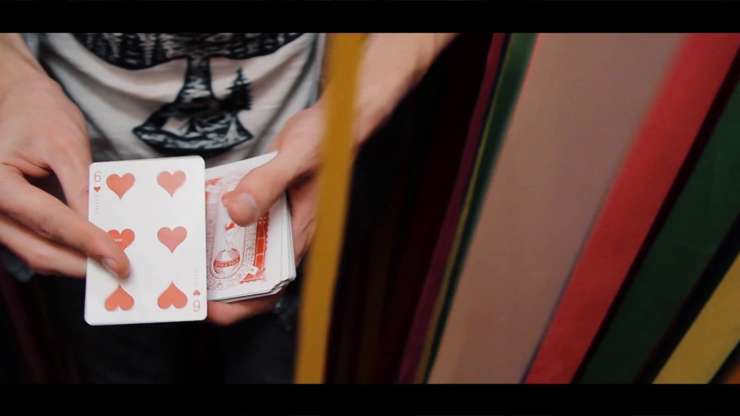 Exmor Trilogy - another great move using in the hands card spread. Exmor could be used as a switch, color change or force. Mac Change - clean transformation of a single card with an open hand. 1337 Load - angle proof switch for a single card that also could have used as a force. Glenn Addition - remastered work on a classic Vernon's Bottom Addition. The move is more clear for a single card, that allows you to use it as force. Bertram Plus - new modern touch for legendary Tebe Change from R. Bertram. This method allows you to do the change twice. Nova Sandwich Move - a visual single or multiple cards production in between the sandwich cards. The move is fast and clear, without any finger movement at all. Citro - new variation for a Cardini Snap Change. You can palm the card or steal it from the top of the deck for a moment. Tasso Change - variation on the R. Walton's Paint Brush Change that makes it easier to perform. Also the change could be done two times on a row. DNB Spread Control - method of convincing card control in the spread based on the work of E. Earick. The move is used for a single card control to the bottom of the deck or bottom palm.